The last time we were in Naples, Florida we stumbled upon a sign for the World Famous Swamp Buggy Races. The sponsors may think they are world famous, but we and everyone else we knew had never heard of the races. In anticipation of the big event we bought our tickets in advance and looked forward to watching this local Everglade spectacular. You can too! Yes, the Swamp Buggies are January 25th & 26th and we have a way you can get Discount Tickets right now (see Resource List below)! 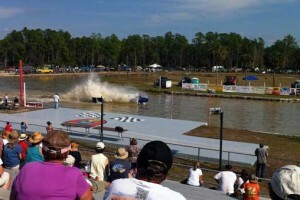 If you are anywhere near South Florida this upcoming weekend, make time to go have some real fun. 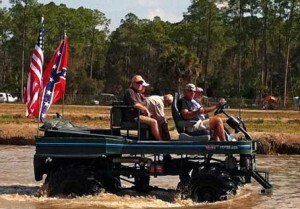 The Swamp Buggy races are a hilarious event where Red Neck and Cracker cultures are celebrated. Swamp Buggies are specially designed high clearance, light weight vehicles with large, skinny front wheels that work in the water /gooey everglades mud. They are a cross between a hydrofoil boat and a land vehicle. No two buggies are alike and they are mostly the creation of home garage mechanics that are a little crazy. The buggies are raced through the Mile-of-Mud. Spectators in the lower seats risk being doused with a coating of the wet, brown natural sun screen. All you have to do is show up, buy your ticket (if you use our link below you can buy in advance and get a discount) and claim a seat in the stands. 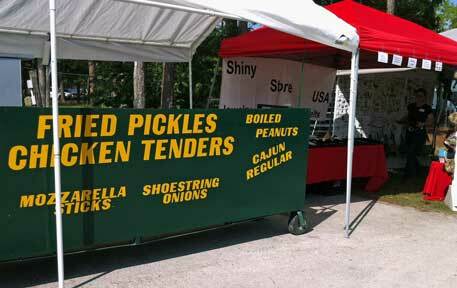 There are vendors for Swamp Buggy Merchandise that you can’t get anywhere else and some regional Cracker Cuisine foods that are local favorites. You might be able to sample Fried Pickles or Okra, tasty Gator Tail bites and local Oysters. Beer is in abundance so don’t try to bring your own. The event occurs over 2 days. The first day is the Practice Day which actually can be the most fun and the least crowded. The second day is the actual races with a lot of excited spectators. 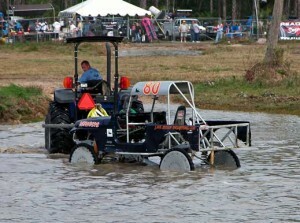 Various categories of the race involve Jeeps and some bizarre swamp buggy vehicles we’ve never seen before. 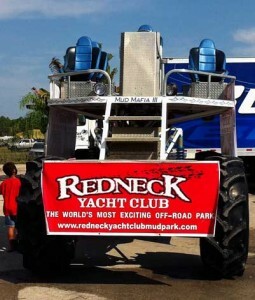 There is a Swamp Buggy parade where visitors can hop a ride on a Swamp Buggy. It is a very family friendly event and there are some activities on Day 2 that are geared just for kids. Outhouses only. No restrooms. They do a good job of keeping them clean. Great kids event, but make sure they have ear protection. Binoculars would be a plus. If you liked this posting consider joining Itchy Nomads to get these sent right to your email box. who would fit right in. Maybe another time or another similar zany race somewhere. Keep your eyes open for local activities like this and let us know Nancy. We’d love to hear about them and probably your fellow, Chris would enjoy them too. Thank you for the comment! on your own life. I know two people who have done exactly that. Know what you want and go for it. A compliment always means a lot more when it is from some one that you admire and respect. We are glad you enjoyed the stories. Our hearts are warmed by your encouragement and loving support. Thank you and lots of love, Suzanne & John,Parrot & Camel love you two!